In this large, comprehensive, revelatory biography, Jane de Hart explores the central experiences that crucially shaped Ginsburg’s passion for justice, her advocacy for gender equality, her meticulous jurisprudence: her desire to make We the People more united and our union more perfect. At the heart of her story and abiding beliefs - her Jewish background. Tikkun olam, the Hebrew injunction to “repair the world”, with its profound meaning for a young girl who grew up during the Holocaust and World War II. 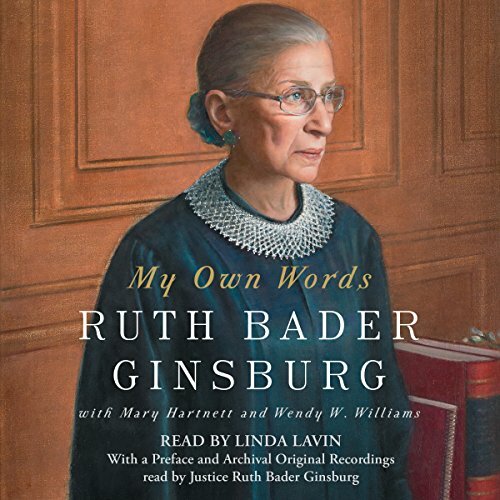 My Own Words is a selection of writings and speeches by Justice Ginsburg on wide-ranging topics, including gender equality, the workways of the Supreme Court, being Jewish, law and lawyers in opera, and the value of looking beyond US shores when interpreting the US Constitution. Throughout her life Justice Ginsburg has been (and continues to be) a prolific writer and public speaker. This book contains a sampling selected by Justice Ginsburg and her authorized biographers, Mary Hartnett and Wendy W. Williams. Justice Ginsburg has written an introduction to the book, and Hartnett and Williams introduce each chapter, giving biographical context and quotes gleaned from hundreds of interviews they have conducted. This is a fascinating glimpse into the life of one of America's most influential women. As others have mentioned it is nice to hear actual speeches by RBG, unfortunately she isn't a particularly engaging orator. Linda Lavin's performance is very good. I was disappointed that a decent amount of the book was dedicated to legal history of the Supreme Court and key Justices, as well as a variety of landmark legal cases (although not a large variety, it gets repetitive). Descriptions of these legal cases contain far more details than any discussion of RBG's life. I don't feel that I learned anything about RBG from this book that isn't in her wikipedia article. I have no doubt those interested in legal history, with RBG's life used as a loose framing mechanism, would enjoy this book. I was expecting a biography about RBG's life, but it was more of a glimpse into life through her eyes. I am glad I listened. 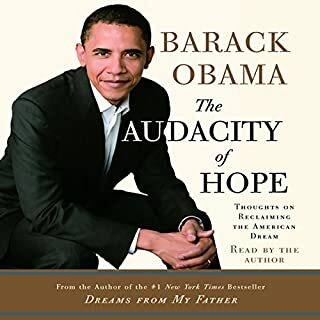 My grandmother (84 yo) had this book in hard copy laying on her reading table and, since we like to read the same books, I got this audiobook version. 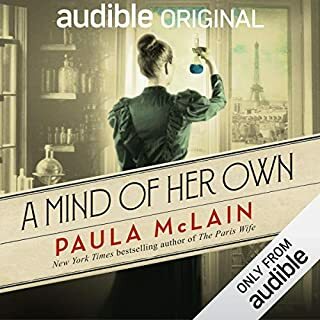 I think this is the first time I have seen this format (audiobook) taken advantage of as a way to hear actual recordings rather than the narrator only reading the script. I think I will tell my grandmother about this because hearing Ruth's voice and cadence really made the story personal. What did you love best about My Own Words? I loved hearing the actual voices of her husband and Justice Ginsburg. The recordings that were provided in Audible would only be read in a hard copy. Hearing the cadence of these voices added much to the book. The honesty of some of the decisions and the logic and careful thought that goes into Supreme Court decisions ere some of the best points covered..
My favorite scene was the opera created and about Justice Ginsburg and Justice Scalia who shared a love of opera and often attended operas with their families. Knowing that they wee close friends even though their beliefs were different, gave me pause to hope that more of us might be able to do the same. Justice Ginsburg painting a human picture of Justice Scalia and her own family. I loved that her daughter stated that dad was the cook and mom used her brain! Very funny! This is a must read/hear though I support hearing it. Linda Lavin does an expert job in the narration. If you are not clear on a strict constructionist interpretation of the Constitution versus a interpretation of a living document that needs to reflect the evolution of the country, this is a must read. If you are fascinated with true stories of extraordinary women, you will devour this read/listen. If you have a daughter, granddaughter, or niece you would like to inspire give them this biography. Ultra-light yet immensely tough. 200 times stronger than steel, yet incredibly flexible. Changing the world. The University of Manchester may have discovered graphene in 2004, but Columbia Law School, Harvard, the American Civil Liberties Union (ACLU) found something much stronger and much more revolutionary years earlier: Ruth Bader Ginsburg. As an Associate US Supreme Court Justice, she's "The Notorious RBG" the Graphene Justice. "My Own Words" (2016) is a collection of the best of RBG's speeches, writings, and dissents from the bench - so far. Justice Ginsburg is only 83 as I write this review, and she's physically active and mentally agile. She could stay for a very long time. I saw her on the bench years ago, and when she spoke, every other Justice got still and silent. What respect. What power. As Sandra Day O'Connor, the first woman on the Supreme Court said - and Ginsburg quotes, "For both men and women, the first step in getting power is to become visible to others, and then to put on an impressive show." I tried to pick out a few parts of the book that I liked best for this review, but I ended up with two dozen bookmarks. The story of how and why she and her husband ended up as co-counsel on a tax law case - appealing to the US Supreme Court based on a one page brief written by a taxpayer who represented himself on an initial appeal - is an exciting underdog triumph. It's a reassurance that sometimes the greatest of changes start small and mean thinking differently. Some parts of "My Own Words" just weren't as interesting to me. Try as I might, I just haven't developed an interest in comparative foreign law and legal procedure. I suspect that. RBG intended to retire this year, so that President Barrack Obama could appoint a liberal to succeed her. The timing of "My Own Words," released a day after the start of the Supreme Court's 2016-2017 term, would have been perfect. The sudden death of her BFF, the very conservative Justice Antonin Scalia on February 13, 2016, must have put that on hold. RBG's been outspoken on a couple of controversial issues recently. She called presidential candidate Donald Trump a "faker". She issued an apology through SCOTUS that, "Judges should avoid commenting on a candidate for public office." RBG didn't limit her comments to to the Alt Right. She just made a more genuine apology for criticizing San Francisco quarterback Colin Kaepernick for kneeling during the national anthem, admitting she didn't know enough about his protest. The book contains a lot of Ginsburg's actual speeches, and is interspersed with actress Linda Levin narrating some speeches and commentary. I've been an avid Audible listener for almost half a decade, and I've never heard anyone so clearly enjoy the story she was reading as much as Lavin does. You can hear the smile in her voice in some happy sections, hear her utter delight at telling the story. I convinced myself that Lavin was from a walk up, cold water, six story brick apartment building with pull down metal latticework fire escapes in Brooklyn. Well, maybe Queens but definitely not the Bronx. That's where Justice Sonia Sotomayor is from, and she didn't sound like her. Lavin is actually from Portland, Maine. 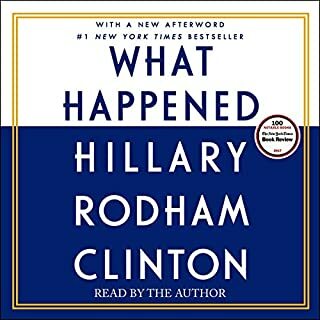 Honestly, my favorite audiobook ever. This book is written to be an audiobook! The inclusion of recorded speeches and statements from Justice Ginsburg and Marty Ginsburg were wonderful, and made the experience really special. (I liked it even more than The Notorious RBG.) For the narrated, bridging portions of the book, the narrator kept the standard high. 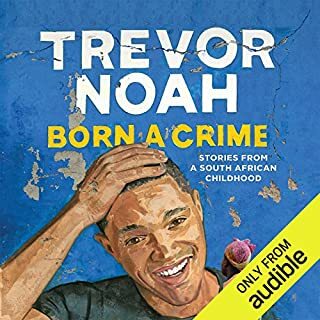 The book flowed between narrated/written portions and recorded/speech portions beautifully, and was engaging as well as educational - I feel like I had come out of a college class on the American judicial system when it was finished. I would definitely recommend this book! 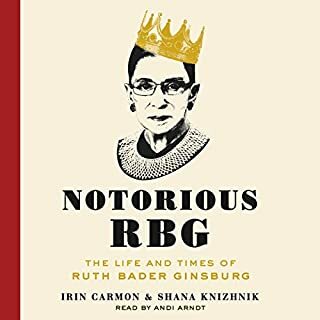 This audiobook is better than the actual book because it contains actual audio clips of RBG's speeches, her husband's speeches, and even a song or two from her opera! The narrator who explains the various clips and reads the excerpts chosen that are not in audio file is quite good as well. A little woman in physical size with a mighty voice and brilliant legal analysis. She shares more than her legal history. 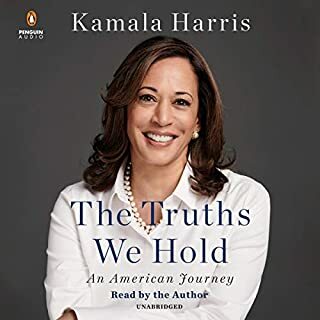 She intertwines it with her personal story and passionate admiration for women heroes, and fond memories of her best friend, the late Justice Scalia. I have so much respect for the strength of this woman. As a liberal I will proudly read Justice Scalia most recent book. This book inspired me to see the good in all, work harder than yesterday and find simple joy in the ordinary. II expected the book would be more about the personal life of a woman and legal scholar who I admire so much. Instead, I learned a LOT more about the laws and Supreme Court decisions that have importantly shaped a growing democracy. I heard an interview with Justice Ginsburg about her new book. Justice Ginsburg stated it was a collection of her writings and speeches since she was in the eighth grade. I have read a great deal by and about Justice Ginsburg over the years so was familiar with most of the material presented. Mary Hartnett and Wendy Williams of the Georgetown Law Center are writing Ginsburg’s official biography which will not be released until after she leaves the Court. They wrote the opening introduction and an introduction to each chapter which including some of the materials they acquired from interviews while preparing the biography. This provides a bit more informative insights to the book. Linda Lavin does a good job narrating the book. Lavin is an award winning Broadway singer/actress and audiobook narrator.